It’s been a while since I’ve posted, but I’m back and ready get to work in the kitchen. My 7 week full time contract job is now finished, I’ve got my freelance work under control and now it’s back to normal. Phew! I’ve been eating a lot of soups and pasta but it’s always nice to have a fresh green salad to make everything better. Last night for dinner, I made the best dressing ever and I’ve been thinking about it ever since. 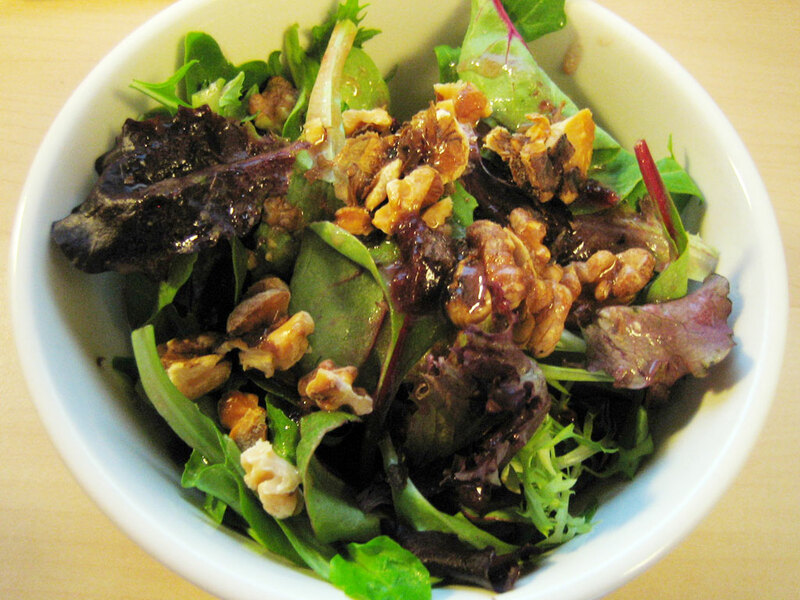 My salad was the standard issue organic greens spring mix topped with toasted walnuts. The secret ingredient? Jam! I used my favorite Bonne Maman Sour Cherry Jam to add a bit of fruity sweetness to my standard vinaigrette and I was amazed at how amazingly fantastic it was. Jam. Who knew it was for more than just toast? Add ingredients into a small jar. Tighten lid. Shake vigourously. Add dressing to a green salad. I´m more of a honey girl for vinaigrette, but the jar and the shaking, absolutely, that´s the best. I have been fearful of buying cherry jam, soley because i thought it only for toast( I could eat then whole jar in about 3 sittings)…But now I can buy it and not devour it only on toast…it makes dressing too! Thnak you! Congrats on finishing your contract. Ingenious really…now I can deplete that ever rapidly breeding supply of cherry jam in my cupboard. Or I could just make toast with it too…salad and toast, does that work? This is definitely my kind of salad!! As of late, I’ve been adding all kinds of nuts (only one at a time)- almonds, walnuts, pecans, pine nuts – to my salad for that mega crunch factor. And, usually something tart/sweet like, orange sections, dried cranberries, pineapple, mango…yum,yum,yum. So, adding cherry jam to the dressing is totally up my alley and I have a jar in my fridge cuz – I love cherry jam! I just found your blog and absolutely love it! Please keep posting! hag, that cherry jam is so awesome it is perfectly understandable for it to be gone in 3 sittings! but buy it and expand the jam horizons!! lobstersquad, honey is fine but jam is surprisingly lovely. i think salad and toast would be a lovely combo, barista! enjoy, joanne! i love nuts too. what can i say, i’m nutty. i had to be said. groan at will. why, thank you, annon! i will! jenn, i’m sure any jam would work wonders. a lovely strawberry could be a perfect reminder of summer! and a sour marmalade would be nice too, i think. sara, you are awesome! for some reason, jam it on the one is my only cosby reference that i’ll ever use. Cherry jam. I can do that but the greens, no they still scare me, unless of course they’re NOT grown in California and in which case that would make them green cabbage, here. Bonne Mamman is one of the best reasonably priced jams. I always think I’ll venture out to something new, Blueberry, Raspberry. And come home with my favourite Strawberry. That sour cherry jam sounds very interesting. I bet it tasted marvellous! Ha! Ah, I too loved Mr. Stevie Wonder breakin’ it down with Theo on the Cosby Show. Jeannette, that tag totally made me cackle when I read it. For some reason, I use that expression, too. Have we ever talked about that?!? !